William Frederick Gill was my grandmother’s brother. He was born in the North East of England, to a family originally from Cornwall, who had moved to work in the coal mines, when copper mining went into decline. On both the 1901 and 1911 census the family were living in Herrington, a small mining village about four miles from Sunderland. I can only assume that he attended the local school and eventually followed his father in the mines. The 1911 census lists him as working as a weighmans clerk [recorded the weight of the tubs of coal produced from the mine]. In January 1915 he enlisted into the Durham Light Infantry (DLI) and was placed in the 18th Battalion. 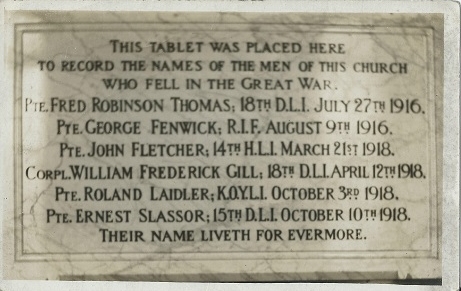 I understand that they were called the ‘Durham Pals’. 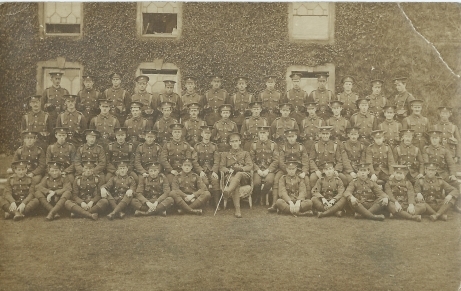 I have no aural or written history, but I do have a photograph, which has been passed through the family, of a military unit of the DLI sitting in front of what I think is Cocken Hall near Finchale. I think he is the young man sitting to the right of the commanding officer on the front row. I know nothing of his military service, other than I have a copy of the 18th Battalion war diary, which begins in Egypt. The 18th was plunged into the thick of the conflict with the diary entries noting everything from trench foot to shell shock and their time on the Somme. But it was the days surrounding William’s death on 12 April 1918 that I wanted to find out more about. It would seem that the battalion were in the area around Hazebrouck in April 1918. The war diary paints a very confused picture with orders changing almost by the hour, parts of the company not receiving these orders, ‘friendly fire’ and the attempt to hold a position near a major road and rail junction. The 12 April diary entry covers several pages and notes many casualties with each company losing about 60 men, including the loss of three officers who were left behind as the companies moved on. I believe William was one of these causalities as his body was never recovered and he is now remembered on the Ploegsteert Monument in Belgium.